Ancona (Greek: Ἀγκών - Ankon (elbow)) is a comune and a seaport in the Marche region, in central Italy. Ancona is the capital of the province of Ancona and of the region. Ancona is on the Adriatic Sea. It is the center of the province and the capital of the region. The city is 289 km (179.6 mi) northeast of Rome. The town is between Monte Conero, Monte Astagno and Monte Guasco. The comune borders with the following comuniː Agugliano, Camerano, Camerata Picena, Falconara Marittima, Offagna, Osimo, Polverigi, Sirolo. The climate in Ancona is an oceanic climate with template summers, Cfa (humid subtropical climate) in the Köppen climate classification. The average temperature for the year in Ancona is 12.8 °C (55.0 °F). The warmest month, on average, is July with an average temperature of 22.8 °C (73.0 °F). The coolest month on average is January, with an average temperature of 5 °C (41 °F). The average amount of precipitation for the year in Ancona is 762 mm (30.0 in). The month with the most precipitation on average is November with 78.7 mm (3.1 in) of precipitation. The month with the least precipitation on average is July with an average of 48.3 mm (1.9 in). There are 100,696 persons living in the comune in 2017, for a population density of 806.6 inhabitants/km². The people from this comune are known, in Italian, as anconetani or anconitani. The Cathedral of Ancona, dedicated to St Cyriacus, was consecrated at the beginning of the 11th century and completed in 1189. It is a fine Romanesque building in grey stone, built in the form of a Greek cross, and other elements of Byzantine art. It has a 12-sided dome over the center slightly altered by Margaritone d'Arezzo in 1270. The interior, which has a crypt under each transept, in the main preserves its original character. It has ten columns which are attributed to the temple of Venus, and there are good screens of the 12th century, and other sculptures. The church was carefully restored in the 1980s. The marble Arch of Trajan, 18 m (59 ft) high, was erected in 114/115 as an entrance to the causeway atop the harbor wall in honor of the emperor who had made the harbor, is one of the finest Roman monuments in the Marche. The Lazzaretto planned by architect Luigi Vanvitelli in 1732 is a pentagonal building covering more than 20,000 m², It is currently used for cultural exhibits. The Episcopal Palace was the place where Pope Pius II died in 1464. The Palazzo del Comune, with its lofty arched substructures at the back, was the work of Margaritone d'Arezzo, but has been restored twice. There are also several fine late Gothic buildings, including the Palazzo Benincasa, the Palazzo del Senato and the Loggia dei Mercanti, all by Giorgio da Sebenico, and the Palazzo del Governo, which has Renaissance additions. 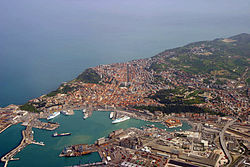 Wikimedia Commons has media related to Ancona. ↑ http://www.comune.ancona.it/binaries/migrazione/ankonline/risorse/Atti_documenti/ambiti/Atti/statuto-comunale-aggionato-in-vigore-dal-18-luglio.pdf; retrieved: 28 July 2011. ↑ 2.0 2.1 "Comune di Ancona" (in Italian). Tuttitalia.it. Retrieved 18 June 2016. ↑ 4.0 4.1 "Statistiche demografiche ISTAT" (in Italian). Demo.istat.it. Retrieved 2 November 2017. ↑ "Comune di Ancona" (in Italian). Comuni-Italiani.it. Retrieved 18 June 2016. ↑ 6.0 6.1 "Ancona, Italy - Köppen Climate Classification". Weatherbase. Retrieved 2 November 2017. This page was last changed on 10 May 2018, at 16:37.